At Arden Jewelers we wanted to make the custom design easy and fun for everyone. So, we streamlined the process to a simple, three step process that is designed to be a rewarding journey to the jewelry of your dreams. Custom design can be a daunting concept, but we work hard to take all the fear and confusion out of it. See for yourself! First, we talk about how you would like your jewelry designed to fit your personal style and taste. We want to give you the jewelry that you’ve been dreaming of so we communicate with you to make sure that’s what you get. Don’t know exactly what you want? That’s fine, we love working with clients to discover what will really wow them in a piece of jewelry. We’re with you every step of the way. 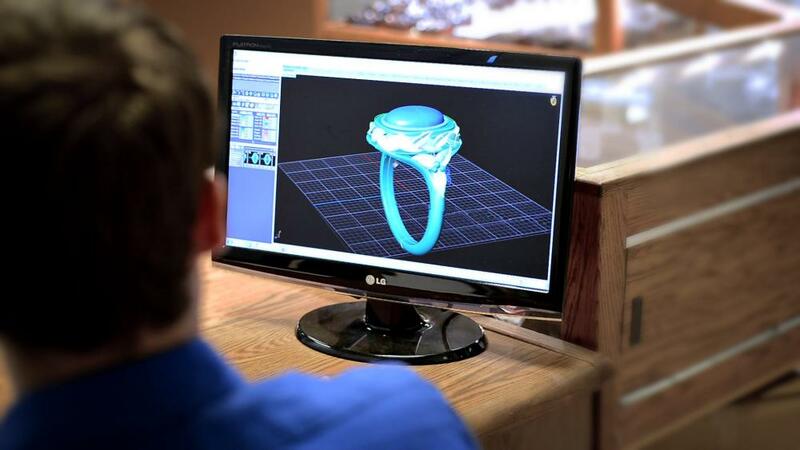 Second, we use high tech computer modeling software to create your design virtually in the computer. This not only greatly enhances the precision of the finished product but it gives you the ability to see your design even before the wax is made. Now you can make adjustments to get it looking exactly the way to want it to before its made. Third, once you approve the design we use high precision 3D printing and milling technology to make a wax model of the computer design. The design is checked for accuracy, and the final piece of jewelry is cast and finished to make it ready for you to wear! This is our favorite part of the custom jewelry process, when the jewelry has made the complete journey from dream to reality! We hope this helped you to better understand the custom jewelry design process. If you still have questions, give us a call or come in to discover how fun and rewarding custom made jewelry can really be.